About a week ago, we ran a poll asking Who's To Credit For Faster Indexing? 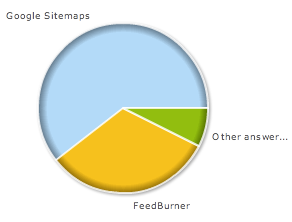 The options included Google Sitemaps or FeedBurner, due to the topic we were discussing. The results are now in and the majority said, Google Sitemaps, in this case, gets the credit for increasing the indexing speed of these sites in Google. Forum discussion continued at Sphinn.